In recent years, parodies of classic childrens’ books have become quite popular. Mixing nostalgia with humour, these books are often aimed at adults, who remember the original books and are willing to embrace a new variation of their favourite childhood stories. The latest addition to this collection of parodies has been released just in time for Father’s Day, with Katie Blackburn paying homage to Maurice Sendak’s classic tale Where The Wild Things Are. Having already published a version for mothers (Where The Wild Mums Are), it was only a matter of time before fathers were given their own version, and this book doesn’t disappoint. 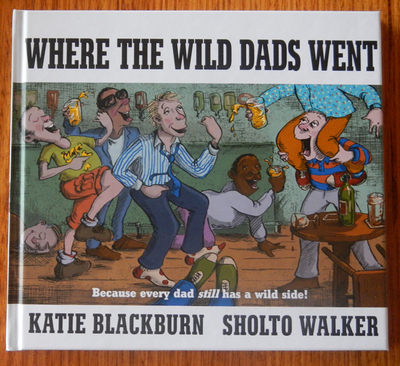 This is a fun take on the original- I’m sure many dads will appreciate the book’s message that it’s okay to make occasional escapes from family life to be with the blokes (provided they don’t get too out of control, that is)! 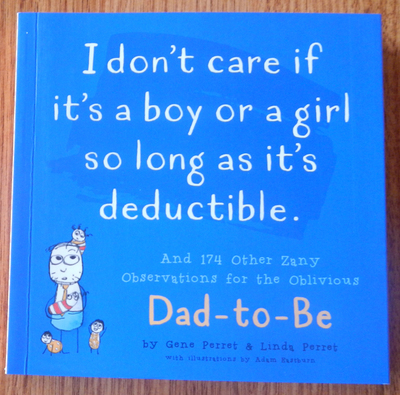 Aimed at those new to fatherhood, this little book gives a humorous take on what dad-to-be’s can expect before, during and after the birth of their child. With a piece of wisdom centred on each page, this book provides 175 ‘observations’ about everything from extra responsibilities, to putting together baby paraphernalia, to fatherly expectations. While this book is quite clever, it would best be given to a married dad-to-be, as most of the observations make reference to wives, husbands and in-laws, rather than unmarried couples. While this likely places limits on the number of dads that will read this book, it is still worth looking at for the funny interpretations of what it means to be a dad (third in the household hierarchy), as well as the accompanying illustrations by up-and-coming artist Adam Eastburn.